We tend to ask for many different things in our life. We want a new house, a new car, and more money. We want more happiness, more patience, and more tolerance. We want to find that special person to share life with. We ask for many things but are not always prepared when the answer shows up. We pray for patience but then get frustrated when the traffic is slow and we have to wait. It is the perfect time to practice the patience we prayed for but we end up angry and frustrated instead of thankful. We pray for the pollen to go away because it is making our allergies act up but then complain about the 3 days of rain that is washing the pollen away. Many times we pray for our families to come together, then adversity hits that brings the family together. If it had not been for the adversity, perhaps the family would have never come together but we end up complaining about the adversity. We must be aware and willing to accept what we ask for when it shows up and however it shows up. I have also come to realize that we may not always get exactly what we want, but we will always get what we need. I am finding that often the opposite of what I asked for shows up to test me. It is the perfect opportunity to put into practice what I ask for. For example, when I start my day off asking for more love and tolerance, everything that is unlike love and tolerance will often show up to challenge me. It is my perfect opportunity to practice the love and tolerance I asked for. Without the challenge, we cannot perfect the skill. We get our prayers answered but are not always aware of the method used in getting the answer. Be grateful for the slow traffic. Be grateful for the adversity. Be grateful for all the rain. They are all giving us exactly what we ask for. What are you asking for in your life? Has it shown up and you just were not aware of it because it did not look exactly as you thought it should? Life changing words to live by. I so relate to this Vince. Vince, this article touched close to home. I often wonder if I am ready for the things I pray for. I often wonder if it’s provided but I did not realize. It is unfortunate that we live in an impatient society. Thank you so much for your response and for being a new follower. I am grateful. You are right, we do live in an impatient society. Everyone wants immediate satisfaction. I look forward to more of your feedback. Thank you so much for your thought provoking response. I love that you talk about how material things spark an emotional response. So many times, I feel we live too much from our emotions as opposed to our spirit. Thank you so much for sharing. I appreciate having you as a reader. Your insight is awesome. You yourself are very insightful and I love the stuff you write. I feel honored to have you as part of my reader base. I am really grateful. Thank you so much for your kind words. I am happy that you’ve decided to join the conversation. I appreciate your support. Great topic this week, Vince! It really made me think back on my own life a bit. Personally, I prefer to learn as much as I can from personal issues, disappointments, and situations that we cannot understand. We all get so very easily caught up in our desires. It’s so easy for us to think if we had certain things, we would be so much happier in our lives. I used to be one of those people! I was constantly spending time thinking about & asking God for things, for stuff, for certain relationships. That lead to some years of reaping a harvest of all the stuff I had asked for. I found myself in a total state of depression & regret. I decided to search for a happiness & a peace I had definitely not found in my own desires. As I began to search for real answers, I was drawn to a scripture that as time went on, I started truly understanding the basis of real inner peace & joy. Our Father in Heaven asks us very simply to just seek the Kingdom Of God. When we just make that a simple prayer, and a simple way of life, understanding that our Heavenly Father knows who, what & where brings us inner peace, we begin to experience life on a whole new level! Also, when we just start practicing basic principles in our lives, such as the fruits of the spirit as written in scripture, we become happier, more well adjusted people. When we ask for certain things in our lives, for instance, patience. We are taught in scripture that patience comes through trials & tribulations! I do believe I would really prefer to work on practicing some patience on my own! These are just good principles to put into practice regardless of your spiritual affiliations, or maybe none at all. Let’s all seek lives that are whole, complete, peaceful, and merciful to others. You never know when that opportunity is going to come along for you to reach out with a helping hand, and a merciful heart to someone in need. What a beautiful thoughtful response. I think you hit the nail on the head, “Seek ye first the Kingdom of God.” However you see God and whatever your definition of God is, it is vital to seek the God first. It is my belief that God lives in us. He is not some separate entity out there somewhere. He is in everything and everyone we see. Your writing is amazing. I think you should think about writing more in an effort to help others. Your writing sure helps me. I appreciate and love you. Your question was, what are you asking for in life? Even at 52, I still want it all. Except now with a large measure of wisdom. Seeking positive energy from all I embark upon. Yes there are sometimes challenges along the way, embrace the best of even a bad situation can make one strong. Thank you Ronnie. Appreciate your input. Thank you for this wisdom! This is a great way to start my week. Thank you so much for the words. I am so happy that my words resonated with you. We all need reminding of the truth from time to time. Much love to you. Great Eye opening Perspective Vincent. 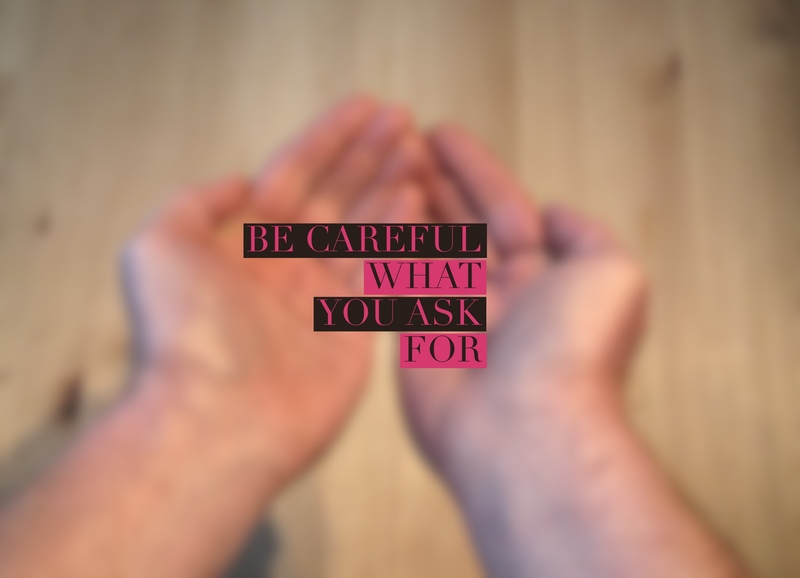 Be careful what you ask for… indeed, but be aware when it arrives. Thank you as always for shining your light. My light feels dim at times but I keep moving forward. I am happy that my words resonate with so many. I am truly blessed. Thanks as always.